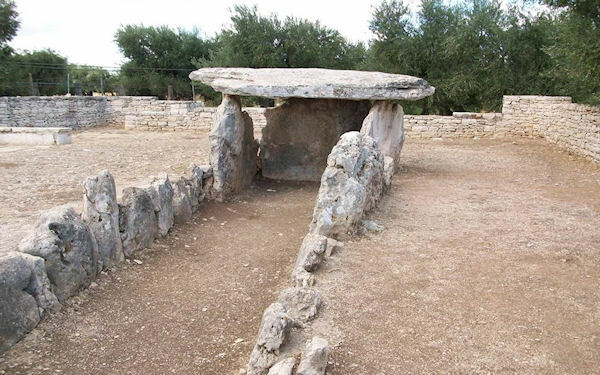 You will visit the area of Puglia that was inhabited in prehistoric times, as shown by findings in the grottoes of Santacroce and the presence of megalithic dolmens. The name may derive from the Latin Vigiliae, that was used for the military outpost surrounded by walls and defended by seven towers on Via Traiana, or alternatively from the non-classical Latin Vescellae meaning forested area. The oak tree that for time immemorial has been the symbol of the town may be connected to pre-Roman times, when populations coming from the Arcadia region, who worshiped Jupiter Dodoneus, usually represented by an oak tree, settled in the area. In the 11th century AD Norman count Peter I fortified the town and built a tall sighting tower, the Torre Maestra, to defend from Saracens raids the population of the 9 villages of Lombard stock in the countryside (Cirignano, Giano, Pacciano, Sagina, San Nicola, Salandro, Santo Stefano, Sant'Andrea, Zappino). In 1059 Bisceglie also had its own bishop. In later centuries the town became a flourishing fishing and trading maritime port. With the Anjou conquest, it became a fiefdom of the Del Balzo family. In the late 15th century powerful walls, able to stand cannon fire, were built, and in 1499 the town was assigned as dowry of Lucrezia Borgia to Alfonso d'Aragona, who was murdered and left one son, Rodrigo, who also died young with no heirs, so Bisceglie returned under direct royal power and throughout the 16th century acquired a remarkable autonomy. The Cathedral of San Pietro, built on a previous church in the 12th century and consecrated in 1295, to preserve the remains of the 3 saints Mauro, Sergio and Pantaleone, martyrs in 117 AD, whose bodies had been found in Sagina in 1167 and disputed among the towns of Andria, Ruvo and Bisceglie. The tradition says that the relics were placed on a wagon drawn by oxen, and the animals left free to go on their own way: the town towards which they would move was to be the custodian of the saints. The oxen slipped in the mud 4 kn from Bisceglie and stopped there in a place called "Pedata dei Santi", where the tradition says there is still trace of the wagon. The church of Santa Margherita founded in 1197 by Falco Falconi, a judge of Henry VI, a beautiful example of Apulian Romanesque architecture, with only one nave, where a precious alabaster urn was kept (now it is in the Archaeological museum) as well as two Byzantine paintings on wood representing Santa Marguerite and St. Nicholas, preserved today in the Pinacoteque of Bari. Along the left side are three magnificent tombs, among the most celebrated in Southern Italy, of the Falcone family, the central sculpted by Pietro Facitulo of Bari, the third and smallest one by Anseramo di Trani, two famous Apulian artists of the Middle Ages. The church of St. Adoeno, one of the most ancient in Apulia, dedicated to Saint Adoeno Dado, Bishop of Rouen and protector of Normandy, was built according to the tradition by the Norman soldiers themselves in 1074. Though originally in the Romanesque style, it was refurbished in the Baroque period. The extremely peculiar facade contains six 12th century sculptures, four representing the forms symbols of the Gospel - man, eagle, bull, lion - two representing a lion and a lioness giving birth, a symbol of Resurrection. The most interesting piece left of the ancient times is the baptismal font, a work of great artistry possibly connected to the Acceptus school, with engraved images where the symbols of the facade are repeated together with a blessing Christ and St. John the Baptist. Please note: Time will be available for lunch (not included in the price). Remember to bring your camera. Please note: Time will be available for lunch (not included in the price).